Our favorite neighborhoods and best San Francisco highlights, featuring 2 Golden Gate Bridge stops and the Official Alcatraz Tour! 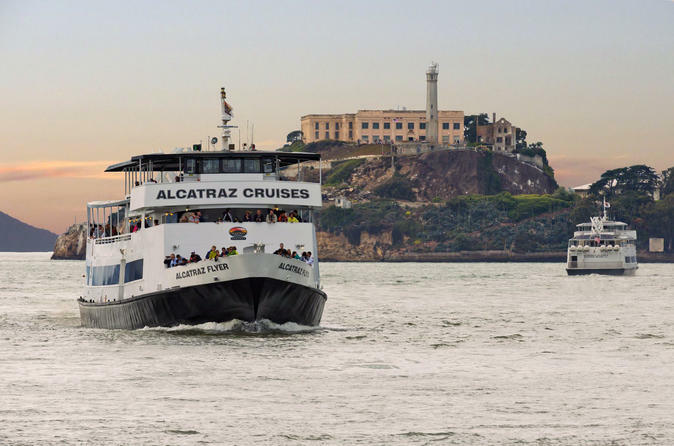 See all of our favorite neighborhoods in San Francisco, including 2 Golden Gate Bridge Stops, then board an afternoon ferry for the Official Alcatraz Tour! 11 different locations, 6 different photo stops, all with a local guide. Get that iconic San Francisco picture at our Fort Point stop with gorgeous views of the Golden Gate Bridge, along with the iconic Golden Gate Bridge stop at Marin Headlands. We’ll meet you at our designated location in Fisherman’s Wharf at 9am. After a brief roll call, we’ll board the bus and travel to our first stop. Over the next 4 hours you’ll be treated to stories about the neighborhoods, diversity, and geography of the area. We will exit the bus at several stops for photo opportunities and exploration. In the afternoon you will be dropped off at Pier 33 for the official Alcatraz audio tour, returning to Pier 33 between 4PM and 5PM. This is where the tour will officially end. Used as a federal prison between 1933-1966, Alcatraz housed some of the most dangerous criminals of the time, including Al Capone, James "Whitey" Bulger and George "Machine Gun" Kelly. Boasting the largest Chinatown in the United States, this 24-block mecca is bustling with energy and amazing food. Offering one of the most scenic outlooks in all of Northern California, Pacific Heights is home to Billionaire's Row, featuring the estates of politicians and tech titans. Declared "one of the 10 wonders of the modern world," the Golden Gate Bridge is one of the most recognized symbols of San Francisco. Simply stunning! Located just beneath the Golden Gate Bridge, Fort Point gives you a front row seat to the Bay and is a great photo stop.